Grand Canyon National Park is a truely awesome place and defies definition. 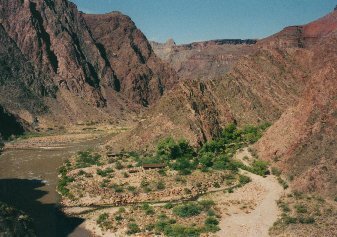 The deepest canyon of the world is certainly as spectacular as it can get. As deep as 5600 ft. (1800m) in places and from 4 to 20 miles (7 to 30 km) wide it's a geological wonder of the first category. 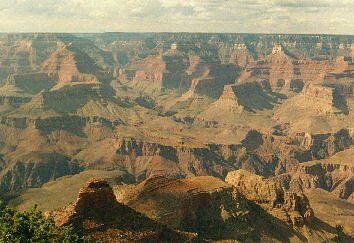 You have two options of getting there, either to the North Rim or to the South Rim, which is said to be more impressive. 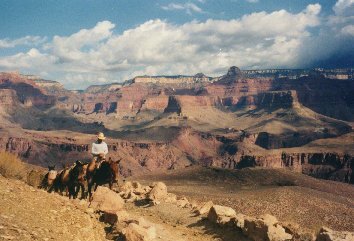 We decided to go to the South Rim and we also did a trail to the bottom of the Grand Canyon. This is actually not advisable if the weather is too hot or at least you should do it early in the morning then. 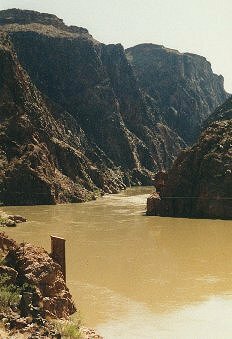 It's not seldom, that the dayhighs exceed 110 degree Fahrenheit (40 degree Celcius) in the canyon. You should also carry enough water for the way down. The park staff actually tell you to carry water for the roundtrip, but this is simply not necessary, since at the bottom there is enough drinking water to fill up your empty bottles. Roughly 7 miles later and 4800 ft. (1600m) deeper the trail ends at the Colorado River.